Snow Days are good for one thing and one thing only… culinary creativity. 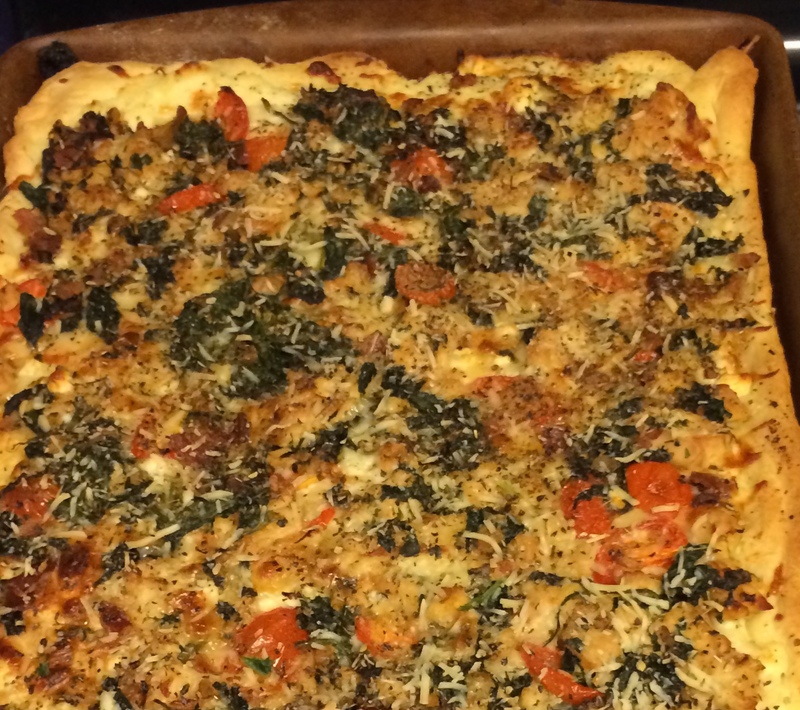 This is my first attempt at homemade pizza, and well, let’s just say it should snow more often. Preheat oven to 450 degrees. Combine all dough ingredients and mix with a fork until dough forms a ball. Sprinkle flour on a cookie sheet and rolling pin. Add flour to the formed dough so it doesn’t get too sticky while you are rolling it out. Spread evenly throughout the cookie sheet until dough is about 1/4 inch think. Brush a thin layer of olive oil on top of the dough. Heap spoonfuls of ricotta cheese on top and spread evenly over dough to form a thin cheese layer. Sprinkle with shaved parmesan, feta, and shredded mozzarella cheese. In a frying pan, following the packaging directions to prepare the grilled chicken strips. Add garlic, cooked spinach, and crumbled bacon to the pan. (Note: When preparing your bacon, don’t let it get too crispy. It will bake even more in the oven). Spread topping evenly over the four cheeses. Add tomatoes and more shredded parmesan. Sprinkle pizza seasoning to taste! Bake for 25 minutes or until crust is golden brown and enjoy!